Last modified 14th November 2018. 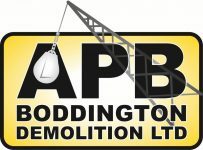 Here at APB Boddington Demolition we take your privacy seriously and will only use your personal details to provide information about our products and services as you have requested from us. If you choose to complete our website form, you will be providing us with information which may include, your name, your email address, and a personal message. The information is collected directly by APB Boddington Demolition. The website only collects the data that you choose to enter into the form. Data captured through the form will be used to contact you in order to respond to your enquiry. A backup of your data will also be stored in the database of our website, but will be automatically deleted after 30 days. Only authorised individuals will be able to access your data, and it will not be disclosed to third parties. If you would like your data to be removed in advance of 30 days, please email sales@boddingtondemolition.com. © 2018 APD Boddington Demolition. All rights reserved. Website by The Buckingham Designer.